Whether you're a staunch small business supporter or you've occasionally stopped into Bushwick's new Dunkin' Donuts on Flushing and Knickerbocker avenues, and are anxiously awaiting the opening of the newest location of Blink Fitness, here's a way you can make sense of the shifts in the commercial landscape of the neighborhood: for the ninth year in a row, The Center for an Urban Future crunched the numbers to determine exactly how many new retail chain locations have opened their doors in New York City. In 2015, the three zip codes representing Bushwick and its surrounding areas in Brooklyn contained 85 chain stores. In 2016, those same zip codes contained 92 chain stores. It's an 8.2 percent increase, which is significantly higher than the Brooklyn-wide average increase of 2.3 percent. What exactly qualifies as a chain store, you ask? "CUF defines a 'national retailer' as one that has at least two locations in New York City and at least one location outside the city limits," explains CUF senior researcher Christian Gonzalez-Rivera. Haters can perhaps take solace in the fact that, according to this definition, even Artichoke Pizza is a chain, thanks to its sole location outside of city limits in Berkeley, California. That being said, it is not necessarily true that the presence of chain stores is a detriment to the economic development of a neighborhood. Chains often bring with them a level of convenience for residents, and there are ways to think about the jobs they provide as more stable than what other small businesses might be able to offer. The report, titled "State of the Chains, 2016" does not track the number of small business closures by zip code, and therefore can't really assess whether the five new chains that opened in Bushwick's 11237 zip code took advantage of vacant space or were filling a neighborhood need unmet by existing businesses. CUF doesn't overlook the city's small businesses, though. Another report released by CUF in November on small businesses in particular concluded that it is difficult for small businesses in New York to surpass a 20 employee benchmark for reasons that boil down to lack of resources (financing, for instance) and difficulty accessing the resources which already do exist. We predict that until the city resolves those problems and makes small businesses development a top priority, chains will continue to find the real estate and customers small business cannot. 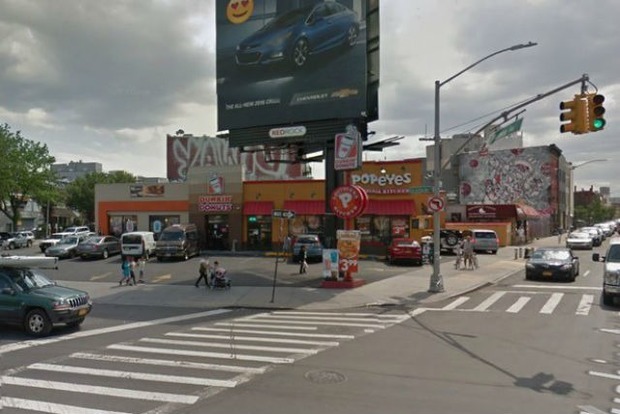 Featured image: The Dunkin' Donuts and Popeyes on Knickerbocker and Flushing Aves.